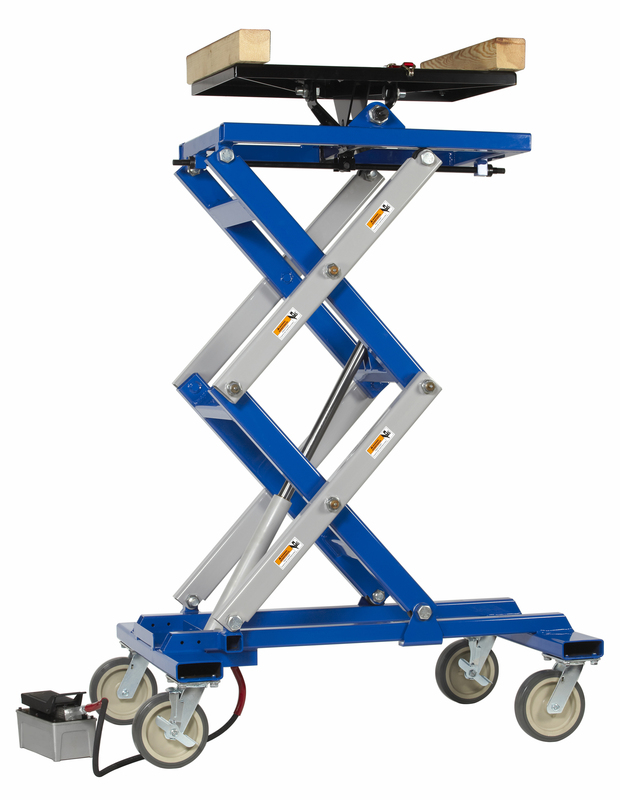 • These lifts will handle engine and transmission assemblies, gas tanks, drive axle assemblies, engine/transaxle assemblies, electric vehicle batteries, and more. • Scissors-type design allows access to all four sides of a component. • Two independent adjusting screws tilt the table ﾱ15° side-to-side, or fore and aft. Can be operated manually or with non-impact air wrench. • 20" x 32" table. • Larger casters provide enhanced mobility under heavy loads. • Air / hydraulic operation - Foot control pump with hose allows movement around lift. • Minimum height is 31-1/2" with an 74-1/2" maximum height. This product can expose you to chemicals including TITANIUM DIOXIDE, which is known to the State of California to cause cancer. For more information for to www.P65Warnings.ca.gov.